Are there any building related questions you have or possibly an unresolved issue? Please feel free to reach out to Darcy, the Property Manager, she will be happy to meet with you and discuss any concerns. Please call the management office at 630-469-3331 or email her at Darcy@stahelin.com. Lease expiration and vacating – If you will not be renewing your lease with Stahelin, you will receive a move-out checklist informing you of steps that need to be taken prior to vacating. It will also give you details on what we specifically look for during the final walk through of your space. If you have any additional questions, please contact Darcy prior to arranging the final walk through. Once again, the Salvation Army Angel Tree program is taking place at all the Stahelin buildings. 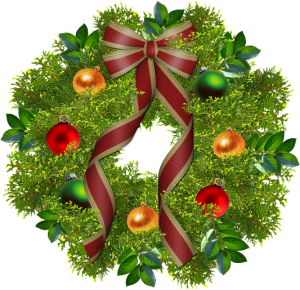 Individual gift tags are placed on the wreaths with items wanted by that child. Not every item on the tag needs to be purchased, but please spend a minimum of $25 on a gift. These presents will be collected by Monday, December 10th at the designated drop off suite in the building. There is only one pick up so please have gifts at the collection site by December 10th. We truly appreciate your participation in this holiday program! Bldg A 3rd floor corridor was completed in early Fall and the 1st floor restrooms also received a minor facelift during that time. The 4th floor corridor received a complete renovation during the month of November with new ceiling tiles, wallpaper and paint. Third floor construction with same improvements will commence in early December. Please keep us informed when the main contact in your office changes so that we can update accordingly. It is very important we stay current with contact information so you continue to receive building notices, emergency notifications or any other relevant information from the Management Office. Thank you! 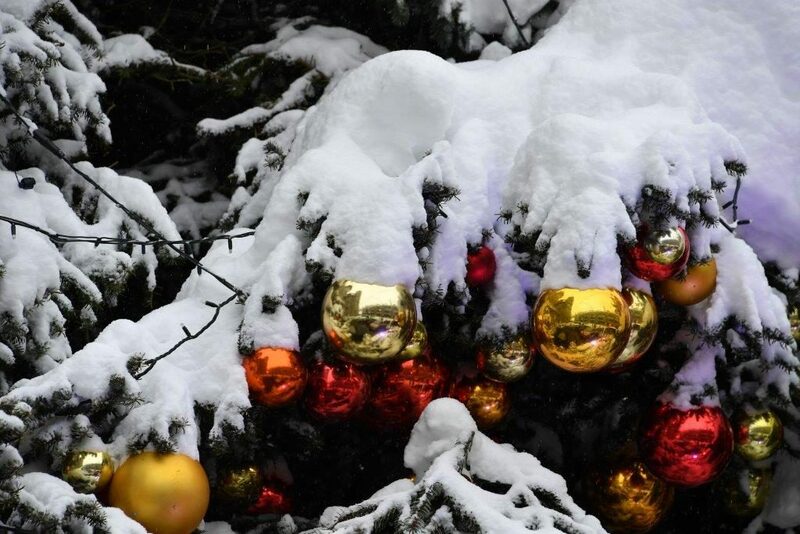 With the snow season upon us, we strongly urge our tenants not to leave any company vehicles parked on the premises overnight – especially when there is snow in the forecast. We need to keep all areas accessible for the snow plows and cannot be responsible if your car gets plowed in. We have received many calls from tenants stating how fast people drive throughout the parking lots. This is concerning to us as we look out for the safety of our tenants. Please reduce your speed – there are many blind areas around the corners and you may not see if another car is approaching. We appreciate your cooperation. 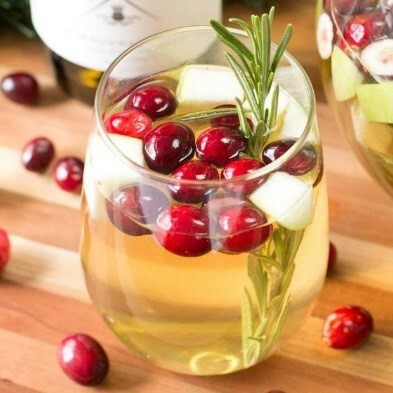 Rosemary, cranberries, and apple make this sangria the perfect Christmas drink that goes with any holiday meal! Combine all ingredients in a large pitcher. Stir together with a large wooden spoon to help the sugar dissolve. Refrigerate for at least 4 hours before serving. Serve chilled with a garnish of rosemary sprigs. Make sure to get some of the fruit in every glass! 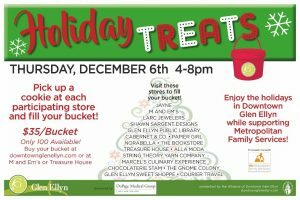 Downtown Glen Ellyn is the place to shop, dine, and donate this holiday season. New this year is an event that will fill tummies with sweet treats, assist you in your holiday shopping, and support a local treasure. All of the proceeds from this Cookie Adventure will be donated to Metropolitan Family Services, a local charity represented through our resale shop in town, Treasure House. The Cookie Adventure begins at M & Em’s Boutique. 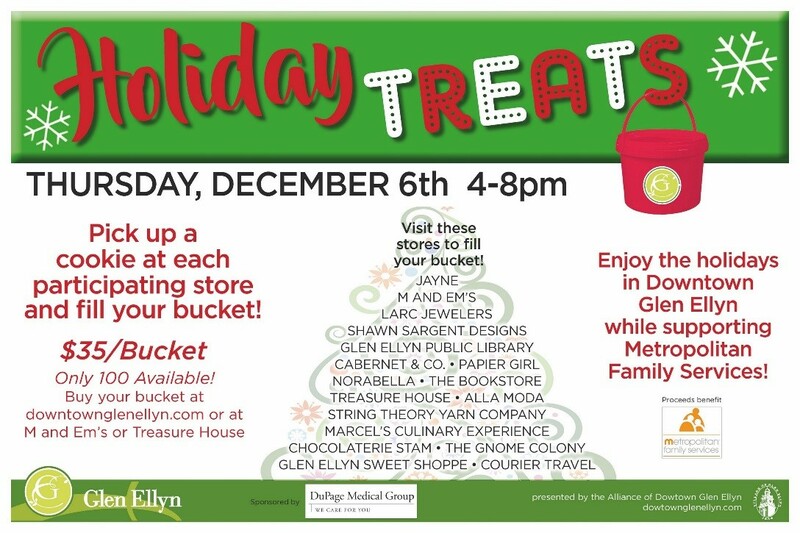 Pick up your decorative cookie bucket and map on Dec. 6th between 4-8pm and enjoy visiting each of the 17 businesses that are eagerly awaiting you, ready to help with your holiday shopping list. Presenting your unique cookie at each location will be a volunteer from Metropolitan Family Services, available to answer any questions about their valuable services provided throughout DuPage County. Cookie buckets are for sale for $35 and should be purchase in advance (as only 100 will be sold). Purchase today either online or at Treasure House (497 Pennsylvania) or at M & Em’s Boutique (460 N. Main Street). With time so limited in December, this is your chance to get three things done at once: fill a decorative bucket with holiday cookies, find just the right gifts for everyone on your list, and donate to a terrific local charity. Come to Downtown Glen Ellyn for your holiday shopping and serve a great cause at the same time, with sweet treats along the way! 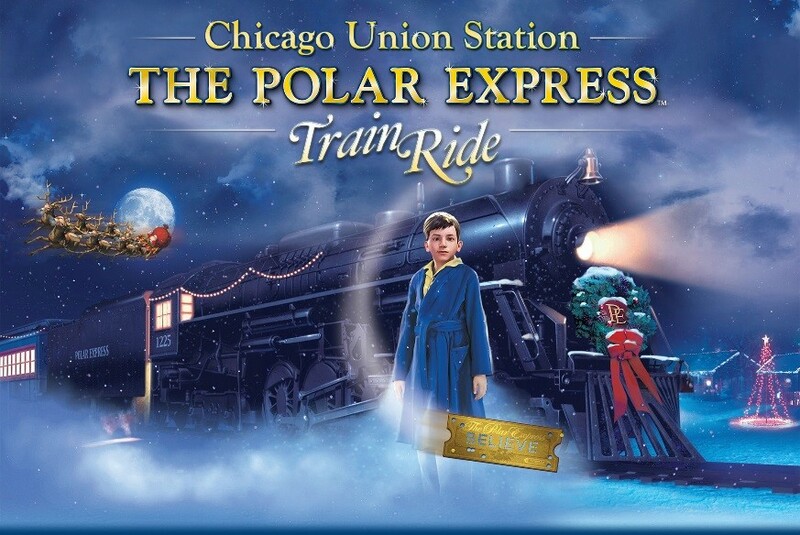 Set to the sounds of the motion picture soundtrack, passengers will relive the magic of the classic story as they are whisked away on THE POLAR EXPRESS™ for a magical one-hour trip through the tunnels, rail yards, and neighborhoods along the Chicago River. Once on board, your car host will work their way through the coach and punch your golden ticket before hot chocolate and a delicious cookie are served by dancing chefs. Passengers then read along with the classic children’s book, The Polar Express, by Chris Van Allsburg. Santa and his helpers board the train to greet passengers and each guest is given the first gift of Christmas – a silver sleigh bell. During the trip, characters on each car lead passengers in caroling and onboard entertainment – just like in the film! Each guest will take home a keepsake sleigh bell in addition to the wonderful memories made on this magical trip. Passengers are required to arrive approximately one hour before their listed departure time and check in at the event area in the Great Hall. Further event information is available by calling a reservations agent at 312-471-2501. Wishing all of our tenants a very Merry Christmas and a Happy New Year! Are you looking to renew or expand? Please contact Jeremy at the Management Office or email Jeremy@Stahelin.com.